My name is Richard Herskovitz. I am 57 years old, married and the father of three beautiful children. In October 2005, I contracted a disease called Necrotizing Fasciitis, also known as “The Flesh Eating Bacteria”. I spent a total of 6 weeks in the University of Maryland Hospital’s Shock Trauma Center. I underwent more than 20 surgeries and spent hundreds of hours in a hyperbaric chamber, trying to save my leg. For the next 15 months, the doctors and I tried to save what was left of my leg. I went through 4 different skin graft surgeries during that time. After consulting many foot specialists, they all agreed that I would never regain use of my foot and ankle. The disease had caused too much damage; I would never walk again using that disfigured foot. In December of 2006, I had my right leg amputated below the knee. After my amputation I did well functionally, but I always had some pain in my stump when I was walking with my prosthetic leg. However, by the end of 2008, the pain in my stump ultimately became unbearable because of the lack of muscle and tissue covering the bones at the end of my amputated leg. 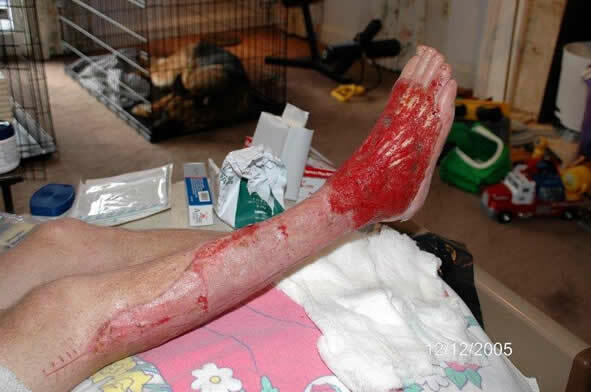 In April 2009 I had a revision surgery to amputate more of my leg to try to cover the bones with more tissue and muscle. Unfortunately, that surgery was unsuccessful. It left me with a stump that was more painful than before. I now had a leg that I would never be able to walk on. After numerous consultations with other specialists, they all agreed that the only way I would be able to walk with a prosthetic leg again was to amputate my leg above my knee. It was a very difficult decision for me to amputate a healthy knee, but it was the only chance I had to walk again. In July 2009 I had my leg amputated above the knee. I was in and out of the hospital for the next four months due to infections in my leg. Once my stump was finally healed I was fitted for a new prosthetic leg. Once again I am at the beginning of a journey... I am learning how to walk all over again. I am slowly but surely finding my way around the gym. My son is a competitive tennis player and I wanted to be able to go out and hit with him. I wanted something special that we could do together. I had been a competitive player in my younger days so I decided that I was going to once again become a competitive tennis player. I practiced and practiced and practiced and finally regained my skill as a decent tennis player. I am able to go out and play with my son. A few years ago I was approached by a group of people in South America about playing in a new world wide tennis league for people like myself who suffer from limb loss or limb differential. This new league is called TAP Tennis (Standing Adapted Tennis). It is for people who do not want to play in a wheelchair but want to play standing. I finished 2017 ranked 23rd in the world for Standing Adapted Tennis. This year I am hoping to break into the top ten. I want to demonstrate that a fine level of fitness and mobility can be achieved by those who face challenges. One just has to go out and do it --- perhaps in a different way, but -- go for it! I started this journey alone, but now I am traveling down a much wider path with a larger goal. I realize now that I am not alone since I have inspired so many others along the way. Thanks to tennis I now have a positive self-image, and I know that achieving this is possible for anyone!!! Click here to see the rest of my videos!